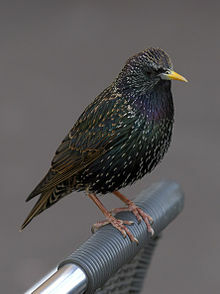 The stirlin (Sturnus vulgaris) (an aa snawbird or stuckie), is a medium-sized passerine bird in the faimily Sturnidae. ↑ BirdLife International (2012). "Sturnus vulgaris". IUCN Reid Leet o Threatened Species. Version 2013.2. Internaitional Union for Conservation o Naitur. Retrieved 26 November 2013. This page wis last eeditit on 10 Februar 2018, at 08:03.